Kingwell produce Refractory ceramic fiber Casting Ladles (pouring cups)for foundry robots, to replace the heavy cast-iron ladle. The ceramic fiber Casting Ladle is of light weight, provide excellent thermal insulation and low thermal mass properties, can be used without preheating. Its non-wetting preventing sticking of a casting skin. The corrosion, which can be mainly observed with metal ladles, does not occur with Refractory ceramic fiber Casting Ladles. The loss of temperature is only approx. 5℃. 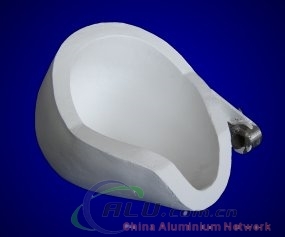 As standard, before delivery a coating is applied to all casting cups, which is also suitable for every saline alloys.